Ok, I have a question for you. Be honest here. How many of you kept a journal of your kids' baby years, detailing their height and weight at each doctor visit, their reactions to trying sweet potatoes for the first time, and where you were when they said their first words? None of you? I though so! We all completely intended to, I know, but most of us wrote down a few details for the first kid, and completely neglected the baby book for the subsequent kids. My older child has a few random pages filled in. When my daughter (child number 2) asked me how old she was when she spoke her first word, I guessed, "right around your first birthday?" Honestly, I really have no clue. Looking back on it now, I wish I had written down more. It is very hard to appreciate the day-to-day life of early parenthood when you have a drooling baby on your shoulder and a clingy toddler pulling on your leg. As the years have passed, though, I've actually gotten better, especially about capturing the little moments that are so easily forgotten. The day the kids played marbles in the basement with friends for two hours. The day we set our pet worms "free" in the front garden. I have my little blue journal to thank. About 7 years ago, my mother-in-law gave my husband this journal for Father's Day, and I quickly realized that I needed to get one for myself. 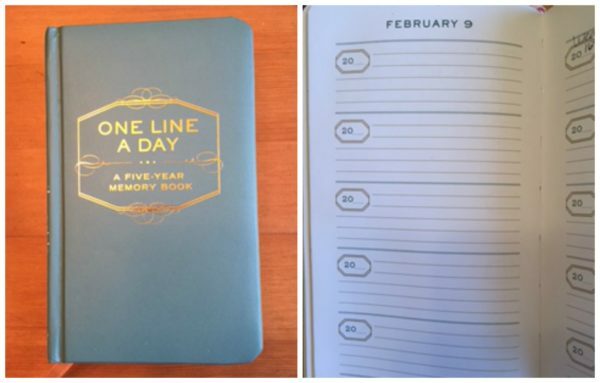 The journal, called "One Line a Day: A Five-Year Memory Book," is about 4"x6" big. Each page has a month and date at the top, and then five "paragraphs" of lines, each starting with "20__." Each "paragraph" has 5 lines. That's it. No long drawn out analysis of why your child screamed half the day. 5 lines. A brief synapsis of the day. It doesn't have to be the whole day. It could just be one line of something that made you smile, or laugh, or cry. My husband and I are each on our second book--our seventh year of writing a few lines each night. He is much better about regularly writing in it than I am. I admit, there are many days, even months, that are completely blank. The month a few summers ago when my mother-in-law was in the hospital--I just couldn't find the strength to write about it. I didn't want to remember those days. But then there are the days that are full for each year. Looking back on what we did one, two, three, and four years ago, really helps me to see that each day is special. It is the little things that show how much our children have grown as human beings, and each little moment should be treasured. Several times I have given the journal as a gift to parents who are expecting or have just had a baby. I wish I had chronicled those baby-on-the-way days myself, describing the kicks, hiccups, and elbows in the ribs that kept me awake. A few years ago, I was searching for a small but meaningful gift for my son's teacher for the end of the school year. I asked him to tell me about things his teacher loved in order to help us figure out a gift. "Her son and writing," was his response. The journal immediately came to mind as a way for her to write about her toddler son. A few weeks ago, I saw that teacher in the school halls. She said that she writes in the journal most days and told me how special it was to be able to relive the moments from the previous years that she had forgotten. She, too, had realized the treasures locked inside the little book, the treasure of the memories that she put in there, the treasures that grow more and more valuable each year.